Just as things were beginning to look up for the crisis-hit Commonwealth Games, fresh criticism hit the Games Village with South African envoy here claiming that a snake was found in one of the rooms even as four more top athletes today pulled out of the mega event. As things surrounding the Commonwealthwealth Games (CWG) are gradually falling in place, all doubts whether the Sports Injury Centre (SIC) would be a part of the health facilities for the Games came to rest today, with the opening up of the Centre by Prime Minister Manmohan Singh in the Capital. Though the country’s first-ever dedicated unit for treating sports-related injuries hasn’t been included under the earmarked CWG hospitals’ list, it would be catering to the health needs of participants during the Games. New Delhi/Wellington: Taking a U-turn, CGF CEO Mike Hooper today owned up the responsibility for the mess around the Commonwealth Games after blaming India's central and state governments for all the problems. Hooper told New Zealand media that the Commonwealth Games Federation cannot be held responsible for the Organising Committee's failure to meet deadlines but later said the apex sport body also has "the same responsibility as any other stakeholder". The pitch at the Sector 16 cricket stadium, which was being termed ‘flat’ by BPXI skipper Gautam Gambhir yesterday, suddenly came alive today witnessing the fall of as many as 13 wickets here. The Aussie bowlers tore apart BPXI’s top order, leaving them tottering on 143 for 6 in just 35 overs at the end of the second day’s play. 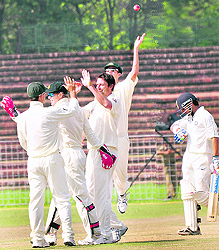 Pacer Ben Hilfenhaus claimed three wickets for 28 in 7 overs whereas Peter George returned with the figure of 2 for 15. Earlier, the Aussies declared their first innings at a mammoth 505 for 8. India’s opener Gautam Gambhir, who made his come back after around three-month layoff following knee injury at Sri Lanka, again sustained an injury on his right wrist here today. The doctors, who took the cricketer for precautionary MRI at a private hospital in Sector 44, termed the injury as ‘soft tissue injury’, which resulted in internal swallowing in the wrist of Gambhir. Muttiah Muralitharan snapped three wickets as Chennai Super Kings restricted Warriors to 128 for seven in the final of Champions League Twenty20 here today. Muralitharan, who took three for 16, got able support from his spin colleague Ravichandran Ashwin (2/16) as CSK restricted the Warriors to a meager total after the South African side elected to bat. Commonwealth Games medal aspirant Rajesh Chander Shekhar of Tamil Nadu won the Hero Honda India Cyclothon, which was flagged off by president, Cycling Federation of India and Minister of Sports, Punjab Sukhdev Singh Dhindsa and Pankaj Munjal of Hero Cycles, here this morning. A snake was found in a room in the residential towers, earmarked for the South African athletes, High Commissioner Harris Mbulelo Mejeke told reporters. "We can't go and stay till things are fixed up. We have very grave concerns. If snakes are found we can't ask our teams to stay there. Yesterday we found a snake but I don't know whether it was an Indian snake. But it was there in one of our rooms," Mejeke said before entering the Village. "That was a threat to the lives of our athletes. Very disappointing. Basically, the basement was full of water and the staircase was also damp," he said. The Village has already been sharply criticised for the unhygienic conditions and now the sensational claim would bring more bad publicity to the event. Criticism also came from, the Indian shooting team who lashed out at the Suresh Kalmadi led Commonwealth Games Organising Committee after they were made to wait for 6 hours to get into the Games Village. The Indian marksmen, who arrived at the New Delhi airport at 9 pm last night, were made to wait at least six hours to get their accommodation at the Games Village. Indian shooters were made to wait at the international airport till 1 am in the night for the pick up bus to arrive. Finally when the bus arrived it didn't have a clearance to take them to the shooting range to deposit their ammunition. When the shooters reached the Village at three in the morning it took volunteers an hour to find suitable furnished flats for the Indian team. As things surrounding the Commonwealthwealth Games (CWG) are gradually falling in place, all doubts whether the Sports Injury Centre (SIC) would be a part of the health facilities for the Games came to rest today, with the opening up of the Centre by Prime Minister Manmohan Singh in the Capital. Though the country’s first-ever dedicated unit for treating sports-related injuries hasn’t been included under the earmarked CWG hospitals’ list, it would be catering to the health needs of participants during the Games. Located on the premises of Safdarjung Hospital, the seven-storey tall centre, was supposed to be a designated treatment centre for the Games, but officials of the CWG Organising Committee remained mum on the issue until last month. “The centre is for all sports persons and anybody who sustains injuries during games would be attended. 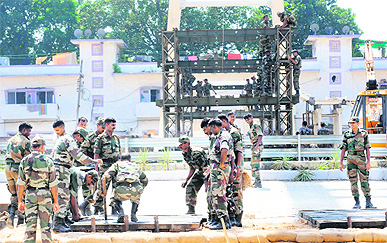 But, it is not a designated centre for the CWG,” said Dr N K Mohanty, the medical superintendent of Safdarjung Hospital. However, it has been learnt that during the 12-day mega sporting, the comperehensive centre coming up just a week before the mega-sporting event, after missing several deadlines- the first being the June end and the latest being Spetember 1, would be offering treatment only to injured Games participants. Following the event, others would have access to the treatment facilities at the centre, which is the first public sector set-up. 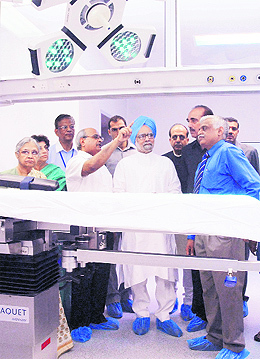 Promising to offer world-class facilities, the centre, built at a cost of Rs 70 crore, has 35 inpatient beds, three high-end integrated modular operation theatres with video conferencing facility and latest diagnostic facilities such as MRI, CT scan, digital X-ray, colour doppler test and bone densitometry. New Delhi/Wellington: Taking a U-turn, CGF CEO Mike Hooper today owned up the responsibility for the mess around the Commonwealth Games after blaming India's central and state governments for all the problems. Hooper told New Zealand media that the Commonwealth Games Federation cannot be held responsible for the Organising Committee's failure to meet deadlines but later said the apex sport body also has "the same responsibility as any other stakeholder". CGF boss Mike Fennell had yesterday admitted that they will have to share the blame for the shoddy preparations of the mega event. "We (CGF) are at the hands and the mercy of, effectively, the government of India, the Delhi government, the agencies responsible for delivery of the venues. 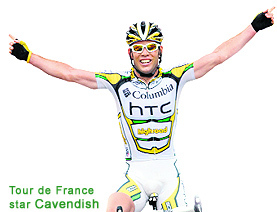 They consistently failed to meet deadlines," Hooper said in a television interview. For Indian Test squad members, S Sreesanth and P Ojha, it was a relieving day, as both players tasted success. While Sreesanth picked up two wickets including that of Aussie wicket keeper Tim Paine and S Smith, Ojha bagged three scalps. But for Cheteshwar Pujara, who has the chance of making his debut n he forthcoming Test series, could not put up a good show as left-arm pacer Mitchell Johnson took his wicket on 9. On the other hand, Australian innings, which resumed from 319 for 1, was boosted by Marcus North with his century (124 off 128), studded with 19 boundaries and two sixes. Earlier in the morning, Ojha brought cheers for the home side as he sent back Ricky Ponting (42) and Michael Clarke (44) in the fourth over of of the day. At lunch the Aussies were placed at 406 for 3 but after the short interval, things changed all of sudden. Sreesanth, who produced an impressive spell in morning session made Paine edge one to wicketkeeper Wridhiman Saha. The rest of th batsmen failed to fire and the visitors finally declared their innings a 505 for the fall of eight wickets. The BPXI got off to a shaky start as Hilfenhaus, who opened the Aussie bowling attack, struck twice in his second over, claiming Gambhir (8) and Rahane (0), with the score at 12 for 2. At one stage, the team was struggling at 53 for 5 before Piyush Chawla provided some relief with his defiant unbeaten 73-ball 64. BPXI 143 for 6 (Chawla 64*, Hilfenhaus 3-28) trail Australia 505 (Watson 115, Katich 104, North 124) by 362 runs. “As per the MRI report, there is no fracture and hopefully, he (Gambhir) would recover before the Mohali Test,” said doctors. Earlier, Aussie pacer Ben Hilfenhaus bouncer delivery (which also snapped Gambhir’s wicket) during the practice match hit the right hand glove of the skipper. While coming out of the field, Gambhir was seen shaking his hand in pain. The doctors’ team consists of Dr Mandeep Singh Dhilon, Head of Orthopaedics, PGI and Dr Indra Rattan, Head of Physiotherapy, GMSH, Sector 16 immediately took Gambhir to GMSH for X-ray. But after that he was taken to private hospital at Sector 44 for precautionary MRI. “Yes, there is an acute pain in my wrist,” said Gambhir, who was supporting an icepack on his wrist while going to GMSH from the stadium. Pacers Dough Bollinger and Albie Morkel bagged a wicket each while Laxmipathy Balaji was unsuccessful. Warriors captain and opener Davy Jacobs (34) continued with his terrific form in the tournament with some lusty strokes and his side looked like to post a big total by racing to 39 runs at the end of the fourth over before they lost way later. Commonwealth Games medal aspirant Rajesh Chander Shekhar of Tamil Nadu won the Hero Honda India Cyclothon, which was flagged off by president, Cycling Federation of India and Minister of Sports, Punjab Sukhdev Singh Dhindsa and Pankaj Munjal of Hero Cycles, here this morning. 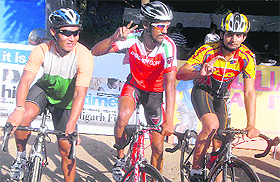 Rajesh covered the 60 km distance in about 59 minutes. Bikram Singh of Manipur grabbed the second position while the third position went to Nirmal Singh of Kurukshetra. Rajesh was awarded a cash prize of Rs 1,51,000 while Bikram and Nirmal got Rs 75,000 and 51,000, respectively. Melbourne: Australian cyclist Travis Meyer and table tennis player Stephanie Sang today joined the growing list of athletes pulling out of the troubled Commonwealth Games in Delhi, citing security and health concerns. Withdrawal by Meyer and Sang took the number of Australian pullouts to three.